We always wanted to go to Tahiti / Bora Bora and we decided that a cruise would be the best way to see the most islands. We would highly recommend the Windstar Wind Spirit. We took a 7 day cruise and loved it. We did not book our flights or any tours through the cruise line. The ship was small - maybe 140 passengers and the food and service was great. We flew in the day before and took the ferry over to Moorea and stayed in an overwater bungalow at the Manava Beach Resort. 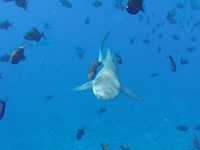 For tours we took... Top Jet ATV Tour on Moorea Arii Moana Tour on Riatea (pearl farm, coral garden snorkel drift, vanilla plantation, & lunch) 4WD Tour, Bloody Mary Lunch, and Shark and Stingray cruise on Bora Bora All great tours - we would highly recommend. We were told later that the Champion Pearl Farm is a little bit of a scam - they don&apos;t actually grow any pearls there but it was still interesting. We would suggest not taking any tours on the day you are at Taha&apos;a. The Windstar&apos;s private island is great. Our first day on Bora Bora we took a taxi to the Sofitel for the day. We sat by the pool all afternoon and lunch was included. I think it was $50 a person. We did not get the drink package on the cruise. It think we spent $500 on drinks for the week. The nice thing about getting the package is that you don&apos;t have to worry about it but I think you drink more to try and get your monies worth. We did get some Hinano beer at the local grocery store on several islands. For pearls we would suggest Eva&apos;s Pearls on Moorea. Overall is was a great trip. We would definitely take another Windstar cruise. We always wanted to go to Tahiti / Bora Bora and we decided that a cruise would be the best way to see the most islands. We would highly recommend the Windstar Wind Spirit. We took a 7 day cruise and loved it. We did not book our flights or any tours through the cruise line. The ship was small - maybe 140 passengers and the food and service was great. We flew in the day before and took the ferry over to Moorea and stayed in an overwater bungalow at the Manava Beach Resort. All great tours - we would highly recommend. We were told later that the Champion Pearl Farm is a little bit of a scam - they don&apos;t actually grow any pearls there but it was still interesting. We would suggest not taking any tours on the day you are at Taha&apos;a. The Windstar&apos;s private island is great. Our first day on Bora Bora we took a taxi to the Sofitel for the day. We sat by the pool all afternoon and lunch was included. I think it was $50 a person. We did not get the drink package on the cruise. It think we spent $500 on drinks for the week. The nice thing about getting the package is that you don&apos;t have to worry about it but I think you drink more to try and get your monies worth. We did get some Hinano beer at the local grocery store on several islands. For pearls we would suggest Eva&apos;s Pearls on Moorea. Overall is was a great trip. We would definitely take another Windstar cruise. All the cabins are the same. Why pay more for the same room one floor up? Walked to the local beach - sat outside at a local bar and had Hinano beer. Great morning tour. Picked us up at the dock. Back by lunch. We just stayed at the La Meridien on Papeete the night after our cruise and flew out early the next morning. We did walk around the market.